"Most porcelain pieces offer much to learn. Many are marked and illustrate a story. I enjoy seeing bold patterns and learning about the makers. If there is a piece of porcelain you are looking for and do not see, please call or email, we may not have cataloged it yet." 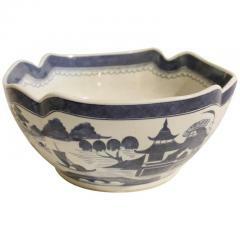 19th century Chinese Canton tall scalloped bowl. 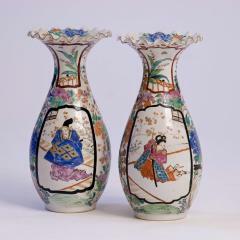 A fine pair of kitani porcelain vases with ripple edge top, polychrome painted woodcut-type scenes.